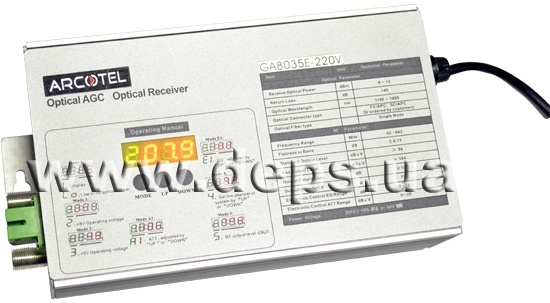 Arcotel GA9036 (OR) — 220V, GA9036 (OR) E-220V is an optical receiver for use in optical sections of cable TV networks. Basically it means networks with deep fiber — optics penetration (FTTH, FTTB). 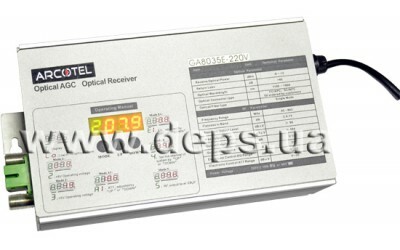 Optical receiver Arcotel GA8035(OR)E is intended for work in hybrid fiber-coaxial networks of cable television with deep penetration of optics. Mainly, they are in-house and in-building networks (FTTH, FTTB). The receiver performs converting of the optical amplitude-modulated signal into the radio-frequency (RF) wideband signal of TV range and following signal amplification for its distribution through the coaxial network. 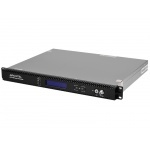 The receiver allows to carry out remote monitoring and control through Ethernet network using SNMP protocol. Main characteristics and technical parameters. 1. Recommended input level of the optic signal Maximum allowed input level +3dBm. 3. Typical value at the input signal level -2 dBm. C/N ratio of optical line of transfer depends on whole number of parameters: input optical power, index of optical modulation, fiber line length, noise characteristics of a transmitter. 5. At translation of 84 channels PAL and output level of signal - 98 dBmkV. The divider had been initially installed providing a second output -10 dB.